A steam cleaner is plenty of fun to use if we’re going to be honest about it. The problem is that some of the most professional steam cleaners out there have hefty price tags of several hundred dollars. Wouldn’t it be great if you could find a smaller steam cleaner that also did the job but at a fraction of the cost? Well, as it turns out, we have exactly that kind of steam cleaner in the Dupray Neat . To begin with, the Dupray Neat is pretty dainty and, well, neat. It’s got a very simple feel to it. No crazy buttons or dials, displays, etc. There’s simply just an on/off button and that’s it! Since its release, it has already made its way to the Amazon bestseller’s list and is winning the hearts of homemakers everywhere. It is the only model from Dupray that the company sells on their Amazon store and that is saying something. We can comfortably say they built this model, especially for Amazon. The price of the Dupray Neat is much lower than those of its other more expensive counterparts. That might make you question whether it is anywhere near as good as its larger cousins. Product Description: Designed for performance, ease of use and durability, this steam cleaner delivers the cleaning power of much larger professional units. 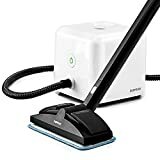 It can easily remove dirt, grease, and stains while killing 99.9% of bacteria, viruses, pathogens, bedbugs, mold and other undesirables from any type of floors, furniture, toys, kitchen appliances, car interiors, grout and tiles, bathrooms and more. It also doesn’t indicate to you the number of hours you have been using it so you know when to flush it. Steam cleaners are some of the most reliable types of cleaners out there. They use a jet of superhot water to clean pretty much anything you need to clean. The Tosca, the larger Dupray, is a heavy-duty steam cleaner and does a lot more than the Dupray Neat could do. However, it is often the case that you don’t want a steam cleaner that comes with all the bells and whistles and would rather find something a little daintier that does the job anyway. Besides, with the forbidding price of the Tosca, you would have to really like your steam to be ready to buy it. The Dupray Neat can be thought of as more of a mini-version of the Tosca. To begin with, it’s not made of plastic. Instead, it’s made of steel. The boiler itself is made of steel, as would be expected. The design is also pretty simple, but also good looking. It’s quite sleek and professional looking. In order to start the steam cleaner, all you have to do is push the one button on the entire machine and wait for the light to turn green. From there it’s just cleaning all the way through. This is exactly the same concept applied to other Dupray steam cleaners, such as the Tosca. The only difference is that the machines are different sizes and use different materials on the outside. In order to assess whether the Dupray is the same quality as its larger counterpart, the first thing to look at is the range of accessories it comes with. Most cheap steam cleaners out there come with some cheap looking and functioning accessories. As it turns out, this isn’t so for the accessories that come with the Dupray Neat steam cleaner. These accessories are just as good and powerful as the ones that come with the Tosca. The brushes on both are actually interchangeable since they are the exact same. As for other things, such as the triangle, floor, and mirror tools, they are slightly smaller than what you get with the Tosca. However, they are still of a high quality. The Dupray Neat itself is pretty light without water. It only weighs 9 pounds when it is empty. As for the water itself, the machine uses normal tap water. You don’t have to use distilled water. You may need to flush it out after you have used it for about 20 collective hours in order to prolong its service life. Other than that, it’s pretty easy to maintain. The tank itself can hold about 54 ounces of water for which will steam for about 50 minutes, which is a fairly long time. That water will take about 7 minutes to heat up to a temperature of 275 degrees. The portable design of the Dupray Neat includes a retractable handle that fits in with the cube design of the steam cleaner. It’s easy to take a hold of and walk around with. It’s also extremely easy to turn the device on or off. All you have to do is push a single button; literally the only button on the entire machine. In order to fill up the Dupray Neat, all you have to do is unscrew the cap on top of the tank and fill it until you see the water begin to pool around the top of the built-in funnel. From there it’s pretty easy to work with. The cord on the cleaner is also designed for easy storage and will wrap around the very bottom of the cleaner. It also has wheels. If you have some really dirty grout you need to clean up, this machine will do just fine! This machine is perfect for maintaining floors to prevent serious buildup as well as taking on bathrooms top to bottom. Check out the result after steaming glass shower doors with about one year of hard water stains and soap scum! I tried the squeegee with poor results. For soap scum you need some scrubbing power. For this I used the corner tool with cover attached. It’s worth noting that i had to scrub pretty hard while steaming. This will vary based on just how much and how long your soap scum has been let build up. Check out the horrible looking shower control! This would take forever with most cleaners. Just a little steam does the trick here! Looks new! Additional information can be found on the Dupray website. This product has 4.6 stars out of a possible 5 from 180 reviews on Amazon at the time of this writing (11/23/18). Pretty much all of the reviews are positive and there weren’t any major complaints about the product. 79% of customers rated it the full 5 stars. Thank you for pointing this out Ruby. The button has been fixed!